The rap on cross-country skiing is that it’s a sport for grown-ups. Cross-country skiing is hard, a workout — “skiing uphill” instead of downhill. All this hard work makes cross-country skiing unappealing to kids, the story goes, and not worth the hassle of teaching them to balance and glide on skinny skis. In certain communities around New England, however, a different story is being told. 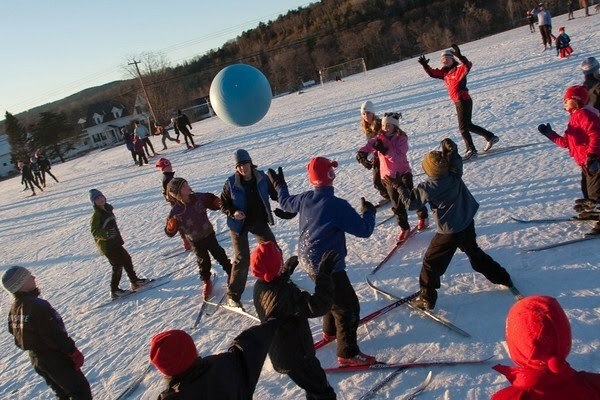 Last year, nearly 1,500 children participated in 50 organized clubs around the Northeast, according to Abby Weissman, youth and introductory programs director at NENSA, the New England Nordic Ski Association. Last year’s participation numbers shot up 10 percent over the 2008-2009 season. And Weissman is fielding an increasing number of calls from people interested in starting kids’ cross-country ski programs. These programs share a name and a philosophy. Bill Koch, America’s first Olympic medalist in Nordic skiing, inspired interest in the sport after winning a silver medal in the 1976 Olympics. Youth programs around the Northeast named their league after the Olympian—but only after Koch extracted a promise from the organizers: Fun had to come first. Peter Milliken remembers having fun on skinny skis when he started in what would become a Bill Koch League program in Carlisle, Mass., at age 5. His forty-something father started at the same time, learning along with his son as he volunteered with the program. The boy liked skiing enough to continue all the way through high school and to race in college. Milliken is now a father and a teacher in a similar program, the Ford Sayre Ski Council in Hanover, N.H. Its Bill Koch League Nordic program also encourages parents to ski alongside their children, learning and teaching. 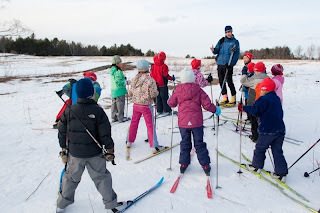 Peter and his wife, Ashley, work with the program’s youngest skiers, first and second graders, a group that has included both of their daughters. Kids are given the skills to race, but the focus is on personal achievement, not on winning. 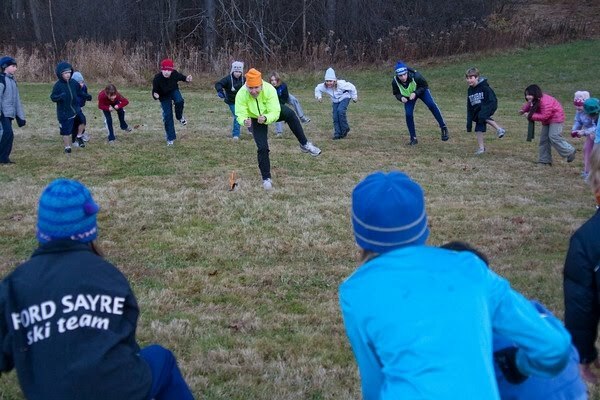 Instructors—like Peter Milliken, many of them former collegiate or even Olympic skiers—teach by playing games. Tag. Relay races. 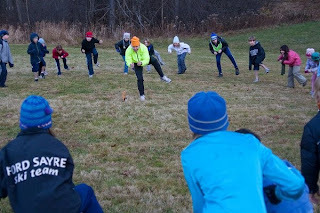 Obstacle course races. Balance games. Activities that slyly teach fundamental skills and give both structure and intensity to the lessons. Caroline thinks that the two of them might be ready to ski some of Hanover’s cross-country trails together. She can see the benefits of the Ford Sayre program out ahead of them in the skiers who are just a couple of years older than Evelina. “I see the older kids zipping along,” she says. “They are so confident, so good, and so fit.” She signed up Evelina, now in third grade, for another season this year. “I didn’t really give her a choice,” Caroline says. It’s only fun if it’s fun. After his first child was born, Goodman started asking other skiing parents how they got their kids on skis. One skiing mom told him, “It’s only fun if it’s fun”—advice Goodman has heeded. If kids have fun skiing, they’ll want to do it again. If they associate it with being cold and miserable, they’ll want to avoid it. Keep it simple. “Cross-country skiing is one of the most accessible sports,” says NENSA’s Abby Weissman. “Kids can just go out in their backyards. They don’t need to go to cross-country ski centers to ski.” Loops around the backyard add up, too: NENSA’s web-based “Ski for Ks” rewards program lets young skiers track their cumulative mileage online. Keep costs down. Nordic skiing isn’t as expensive as downhill skiing, but the gear can be costly, and choosing among options can be intimidating. Communities with ski programs often hold ski swaps and support retail stores that rent equipment. NENSA has worked in recent years to lower the cost barrier, creating a ski-lease program for its members. Cross-country ski centers often rent gear as well. – Check out some ski games used by the New England Bill Koch League. – Listen to Bill Littlefield’s “Only a Game” January 30, 2010 NPR segment on the Bill Koch League in eastern Massachusetts. – Find more information on the Ford Sayre program in Hanover, NH. – Purchase a copy of Best Backcountry Skiing in the Northeast: 50 Classic Ski Tours in New England and New York, by David Goodman.